Pocket Opera are Pat Leighton, Helen Roberts and Martin Le Poidevin with Kathy Gibbs at the piano. We sing to sell out audiences in venues around Bristol. 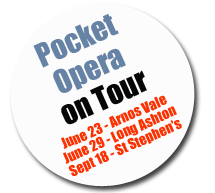 Our next performance of songs, arias and of course the Pocket Opera (the opera that the composers really meant us to hear, but by a quirk of fate never got performed) is at Arnos Vale on 23rd June 2019. We’re then at All Saints Church in Long Ashton on 29th June.